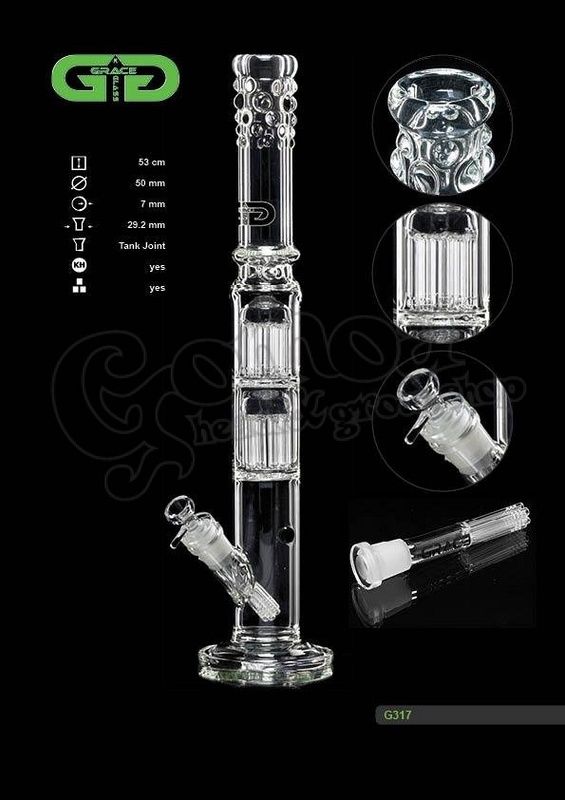 This "Crystal Cane" Grace Glass Bong is an exceptional piece of glass art that will give you a smashing hit! It is made of a robust heat proof borosilicate glass, formed in the shape of a bouncer base tube. A detachable chillum with a sure ground of 18.8mm diameter is used in order for your smoke to spread into the tube and get filtered by the water. The chillum connects to a green bowl on top of it for placing your tobacco or herb. A 2 x 16 arm percolator will bubble up your smoke for soothing your toke, some ice noches can hold a few cubes, for cooling your smoke, and a kick hole at the height of the sure ground will offer you the option of enjoying a different toke angle. With the Grace Glass logo featuring at the top of the tube, the whole set-up ends up in a cosy green mouthpiece ring through some glass beads beautifully shaped all around.